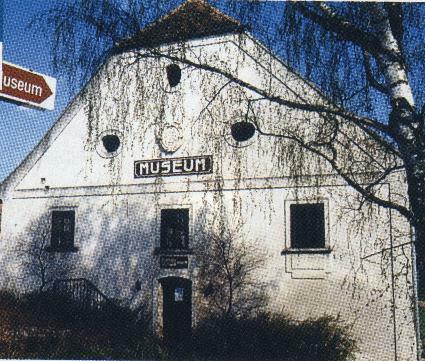 The Museum is located at the corner of Stremtalstrasse and Dammstrasse, indicated by the red arrow in the upper right section of the picture below. It's not very far from the Burg Gussing as you can see. We arrived practically on the heels of a gentleman just opening up the Museum. As we were the only ones there, he proceeded to show us around, explaining all the pictures and items on display. We thought he was extremely personable and very knowledgeable. It wasn't til the tour was practically over that we discovered our tour guide was Dr. Dujmovits himself! Talk about embarrassing moments! 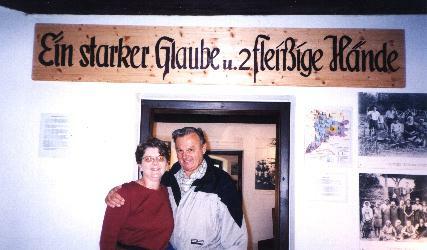 We noticed a map on the wall showing what part of the United States the Burgenlanders migrated to, starting with the northern part all the way down to the Jennersdorf area. We discovered that a great number of those from Jennersdorf and Grieselstein went to New Britain, Conn., which happens to be the city where my sister and I were born and spent our childhood. Our grandfather, August Mandl, was born in Grieselstein, and came to the United States in 1905, sailing with four other young men from the same area and going to the same boarding house. Translated: "A Strong Faith and Two Hard-Working Hands"